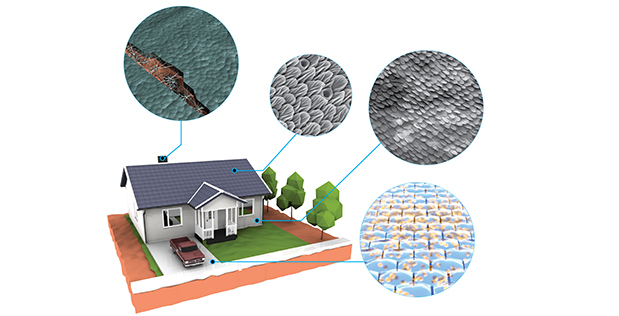 Seeking to develop methods and tools for engineered living, programmable construction materials, DARPA has opened a Broad Agency Announcement (BAA) soliciting futuristic research proposals. Structural materials currently in use for constructing buildings, homes, and infrastructure wear out due to age and damage. They are expensive to produce and ship and offer limited responses to changes in their environment. Biological, living materials like skin, bone, coral, and bark, offer significant advantages over non-living materials. Growing and adapting to environmental changes, living materials have the ability to self-repair if damaged. DARPA admits to taking inspiration from current biologically sourced construction materials, like organic or “bio” bricks grown from corn stalks and mushroom mycelium, or bricks injected with bacteria. The proven feasibility of the factory-scale production of grown construction materials like bio bricks encourages the ELM program. Using a biological approach to reducing energy and waste associated with manufacturing structural materials is spurring great scientific and commercial interest. However, ELM’s Gallivan is imagining something on an altogether different level. Bio bricks made from bacteria or fungal mycelium are “alive” only during the growth of the product. Wood is alive only until it is harvested. But the manufacturing process effectively kills the living cells, rendering these construction materials inert. The biological advantages of live bacteria, fungi, and wood are lost. Searching for a manufacturing process that doesn’t kill living cells, attention has turned to 3D printing. With innovations and progress occurring daily in this field, living tissues and organs are now within the reach of scientists. Using scaffolding materials, scientists are manufacturing and sustaining the long-term viability of living cells derived from existing natural tissues. Building on the best features of current biotechnologies, the first phase of DARPA’s ELM program aims to create programmable, hybrid living construction materials. Gallivan, light-years ahead of today’s designers of 3D printers, envisions manufacturing living cells engineered to perform synthetic functions based on environment-specific factors. These new hybrid materials would be composed of non-living scaffolds providing structure for and supporting the long-term viability of engineered, programmable live cells. This is the basic starting point for materials such as hybrid roof shingles with living, self-repairing, photosynthesizing surfaces. Or something a little easier, like hybrid driveway pavers that “swallow” oil. On top of all this, Gallivan also imagines ELM will manufacture these hybrids less expensively than today’s 3D cell-printing methods. To produce his hybrid living construction materials on an industrial scale, DARPA’s ELM program needs to invent much cheaper tools and techniques. “Image of pyramidal neurons in mouse cerebral cortex expressing green fluorescent protein.” DARPA-IBM’s neuro-synaptic computer chips are designed to mimic the brain’s neural structures. Unlike mine, DARPA’s futuristic dreams usually do come true. Although self-repairing construction materials seem impossible (or at least bizarre) today, we could easily be growing live GMO Solar Shingles on tomorrow’s rooftops. DARPA has an awesome reputation for making futuristic dreams come true. • National weather forecasting generated via satellite data originated from a 1958 DARPA prototype. • Advanced satellite imaging and mapping originated from a 1960 Corona satellite imagery program jointly partnered by DARPA and the CIA. In 2004, Google bought the program from DARPA and renamed it Google Earth. • The Global Positioning System (GPS) originated in the early 1960’s with DARPA’s Transit program. The first satellite navigation system, Transit, went into service in 1964 for the US Navy’s ballistic missile submarines. • Modern computers also originated with DARPA in the 1960s. In 1968, the first computer with a mouse, a graphical user interface, and hypertext links was developed by a DARPA/US Air Force-funded program at Stanford Research Institute. Called oN-Line System (NLS), it was the forerunner of Xerox PARC’s Alto computer. The Alto was Steve Jobs’ inspiration for his Macintosh. New computer technologies, like neuro-synaptic chips are still coming from DARPA projects, too. • The Internet was born in 1969 when DARPA established ARPANET, laying the structural foundations for the entire virtual universe.